Every week we pull together some great Canadian recipes from Canadian food bloggers around the web featuring one main ingredient or dish. This year, Pantone's colour of the year is Greenery so we're going all in and celebrating green food! Go green with a **[Green Pizza with Herbed Vegan Cashew Cheese](https://thestingyvegan.com/green-pizza-herbed-vegan-cashew-cheese/)**. From **The Stingy Vegan**. 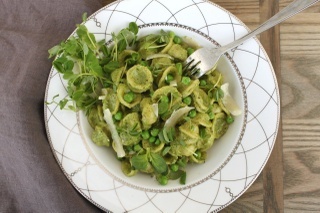 Pretty **[Pea Pesto Orecchiette](https://dishnthekitchen.wordpress.com/2016/06/21/summer-pea-pesto-orecchiette/)** brings spring to your dinner table. From **Dish 'n' the Kitchen**. Delicately flavoured **[Matcha Cupcakes with Green Tea Cream Cheese Frosting](https://ilonaspassion.com/matcha-cupcakes-with-green-tea-cream-cheese-frosting/)**. From **Ilona's Passion**. A sweet green treat - **[Green Tea Ice Cream](https://everydayonoccasion.wordpress.com/2016/07/13/green-tea-%EF%BB%BFice-cream/)**. From **Everyday on Occasion**. For an alternative to kale chips, try **[Collard Green Chips](http://thecookiewriter.com/collard-green-chips/)**! From **The Cookie Writer**. The perfect condiment to have in your fridge at all times: **[Goes With Everything Green Sauce](https://coniferesetfeuillus.com/2016/09/11/goes-with-everything-green-sauce/)**. From **Conifères & Feuillus**. A bowl of green - comforting **[Slow Cooker Miso Ramen with Broccoli Rabe & Zucchini Noodles](http://yummybeet.com/slow-cooker-miso-ramen-broccoli-rabe-zucchini-noodles/)**. From **Yummy Beet**. Stay warm with this creamy(less) **[Cream of Asparagus Soup](http://www.aheadofthyme.com/2016/03/creamless-cream-of-asparagus-soup/)**. From **Ahead of Thyme**. Perfect for a St. Patrick's Day treat or for an everyday coffee break: **[Chewy Chocolate Mint Chip Cookies](http://bakeeatrepeat.ca/chewy-chocolate-mint-chip-cookies-recipe/)**. From **Bake. Eat. Repeat**. Click on the photos to be taken to the recipe. Sarson Ka Saag With Tofu | To Eat or Not To Eat. A big thank you to all our FBC Members who participated in this week's go green roundup!